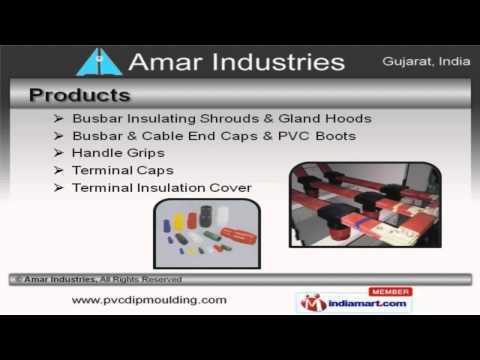 Welcome to Amar Industries, Manufacturer and Exporter of PVC Dip Mouldings. The company was founded in 2006 at Vadodara. Transparent working procedures and Flexibility in Management help us to achieve a present repute in the market. Stelmec Limited and Jyoti Limited are some of our prestigious clients and we are backed by highly competitive prices and Flexible payment modes. We offer a huge gamut of Busbar Insulating Shrouds, Handle Grips and Terminal Insulation Covers. Busbar Insulating Shrouds and Gland Hoods offered by us are extremely reliable. Our organization is highly involved in providing an impeccable range of Busbar and Cable End Caps and PVC Boots. We are engaged in offering supreme quality Handle Grips that are a class apart. Our clients can avail from us an exquisite range of Terminal Caps that are cost effective. Our Terminal Insulation Covers are setting a benchmark in the market.